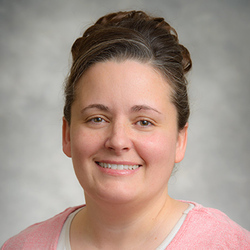 Professor Furcsik has been with Aultman College since 2014 and is currently an assistant professor instructing across all programs of the Nursing Division. She strives to make a positive impact on the future of her students by promoting learning in and out of the classroom. She believes that from developing new and innovative teaching strategies to structuring inspiring curriculum, the faculty at Aultman College is student-centered and invested in student success. After receiving a bachelor of science in nursing from Kent State University in 1999, Professor Furcsik later continued in her pursuit of education, and received a master of science in nursing from Walsh University in 2014. Her nursing experience includes primary, long term, and rehab care. She also has further validated her education by obtaining her certification in nursing education. While nursing education is her passion, she also is actively involved in the community by serving in various roles at her local church. She enjoys spending time with her husband and children; as well as visiting the beach, sewing, and caring for the family dogs.